I got the new Crumb book for Christmas off my brother. I enjoyed it no end, the drawing is brilliant as you would expect. 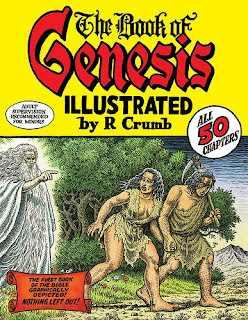 Crumb really doesn't leave anything out (as it says on the cover 'All 50 Chapters') so I must admit I skipped through the many pages of thingy begot thingy, and his sons were... Crumb does a lovely job of making up the hundreds of different faces for these chapters, all individuals, but they are still just lists of names really. He doesn't do anything satirical or change much as he goes along, just kind of illustrates the stories, which are really weird when you re-read them again. I thought his notes at the end were good too, he has done lots of research and has read some interesting ideas about the stranger bits, which don't make much sense when you read them straight from the text.